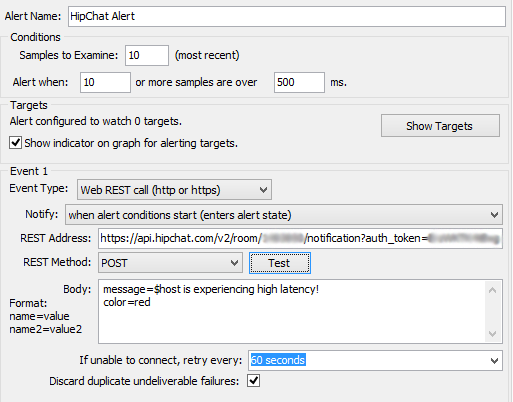 How do I get network alerts in a HipChat room? I'd like to receive PingPlotter/MultiPing alerts via HipChat so that I can keep my whole team notified of any network issues. Is there a way to do this? Unfortunately, Stride/HipChat services were discontinued on February 15, 2019. We're just not ready to let go, so we're leaving this Knowledge Base article up for now. 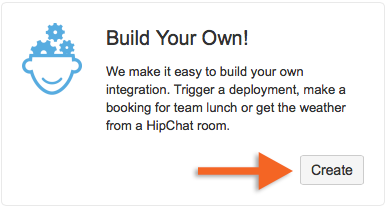 HipChat has made implementing a REST call with their tool a very, very easy process. Copy that URL, and then head over to PingPlotter/MultiPing to finish setting up your alert! If you need a refresher on setting up alerts in PingPlotter or MultiPing (or if you're looking for some "best practices") - we've got a knowledge base article that can help out here. Set the event type in your alert to "Web REST call," and then enter that custom URL you copied into the "REST Address" field, and set the "REST Method" to "POST." You'll then want to set the body of the message (thus, the "message=" parameter). We also want our alert message in this HipChat channel to stand out a bit, so we're specifying a color (the "color=" parameter). 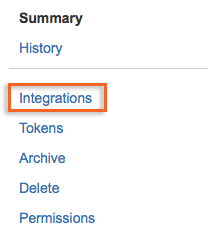 There is a whole slew of other things you can do here - for more info, check out HipChat's API documentation. Success! Now we can associate this alert with a few targets, and keep our whole team informed about any unsavory network conditions. If you should find yourself with any questions or needing any assistance in getting REST call alerts set up - don't hesitate to contact our support team at support@pingman.com.